Here is a huge project in process. 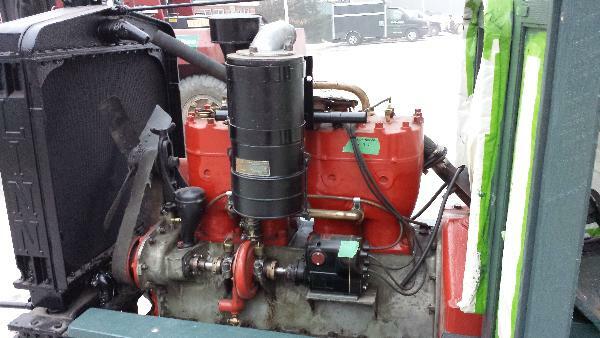 As if restoring a Linn tractor wasn`t enough work this one has the first hydraulic Gradall ever built sitting on it. A little history, if I can get my facts straight. 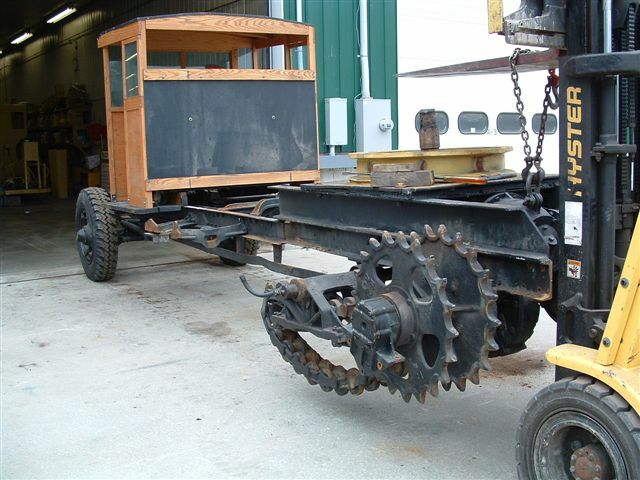 This Linn is a 1928 originally sold as a town plow truck for Franklin N.Y. The Linn was traded back to Linn Manufacturing in 1941 where it went through a rebuild and sold to F.W.F. Corp in Ohio. F.W.F. 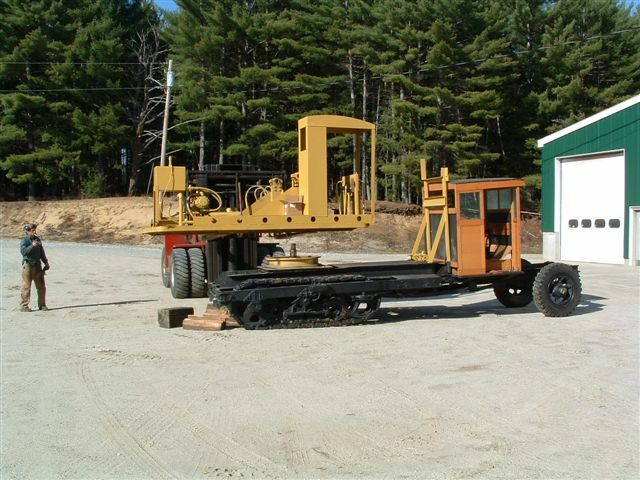 Corp was building cable operated machines for ditching using a truck mounted arm and I beam like a garden hoe to grade ditches. 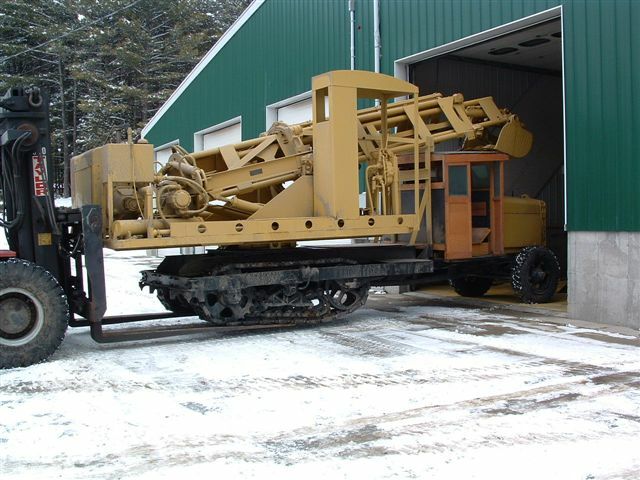 In 1944 they introduced there first hydraulic operated hoe and it had other attachments such as a bucket for digging. The unique thing about this machine is the arm could swivel to grade a ditch from almost any angle. 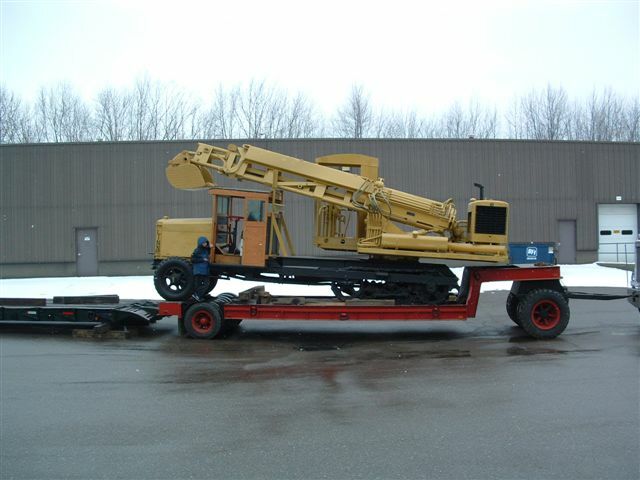 Soon after this machine and two others were built, all mounted on used Linn tractors, F.W.F. 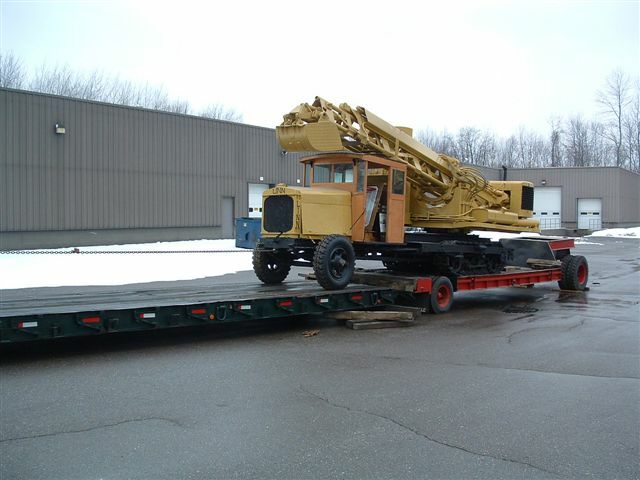 Corp sold to Warner & Swasey of New Philadelphia Ohio and they began to improve and mass produce the machine that they called a Gradall. 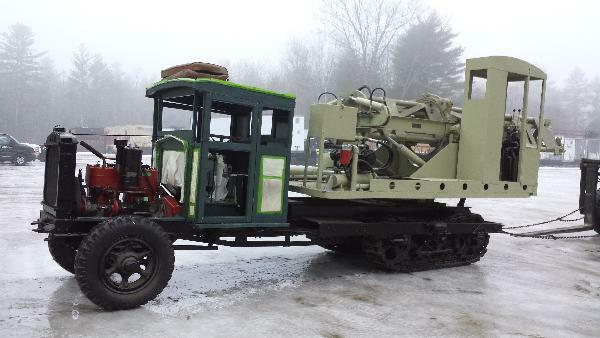 Around 1965 someone from Warner & Swasey stumbled upon this Gradall Linn in a scrap yard already cut into 3 pieces. 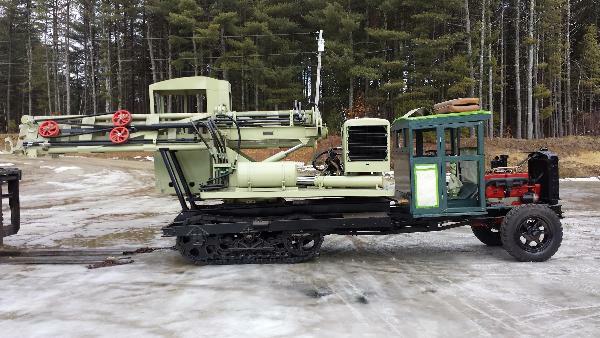 Warner & Swasey purchased the machine and started to restore it but it was apparently not high on the to do list. Around 2001 they decided to put it together for static display purposes. 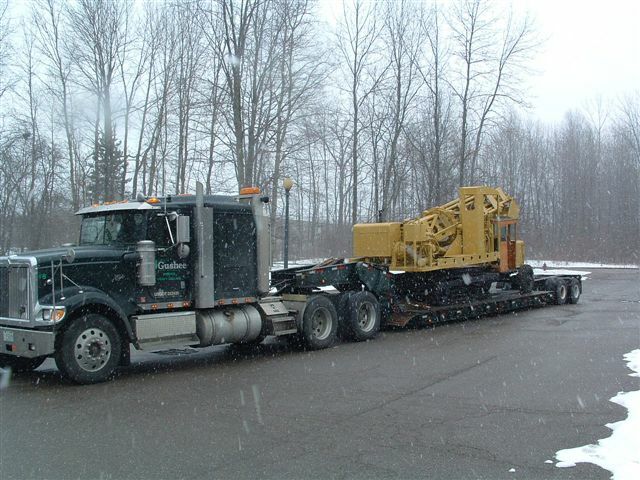 And in 2002 took it to ConExpo 2002 in Las Vegas. 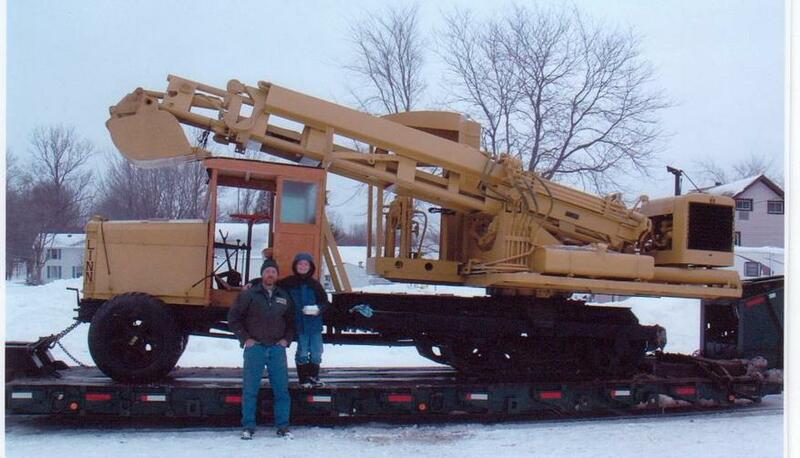 After that Warner & Swasey experienced tough times and prior to bankruptcy donated this machine to a museum in Ohio. The museum has primarily cars and this contraption did not fit the display. It was offered for sale and seemed like something that fit my collection very well. 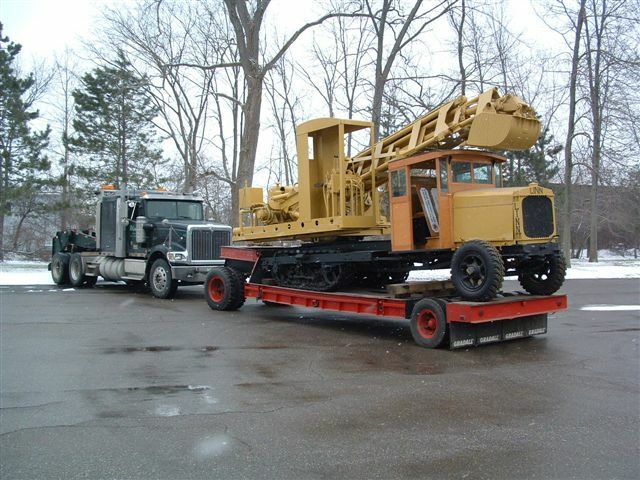 This is a picture of the Gradall Linn when we went to the museum in Ohio to pick it up. It was sitting on the 40`s vintage Fruehauf full trailer that came in the package. Jack and I pulled the trailer using the tow hook on my road tractors front bumper. We blocked the lowbed up high to match the height of the old lowbed. Using the towhook again we pulled the Gradall Linn onto the transport trailer. If you look close you can see the pull chain. Swap complete, Just in time to head out in a snow storm . Photo taken in Verona N.Y.on the way to Maine from Ohio. We couldn`t bring it through without stopping to show Ernest Portner, Rene Elliot, and Erik, we were all very excited to see another Linn headed for a full restoration. The arm on the Gradall was only designed for about a 270 degree swing over the back and sides. It has been welded in this position for display. 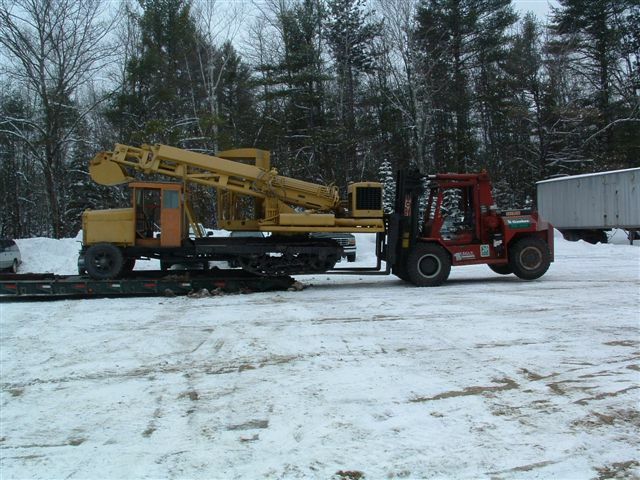 Gradall Linns are heavy, That forklift will pick 30,000#. We got the back wheels off the ground. Going straight in to start restoration. 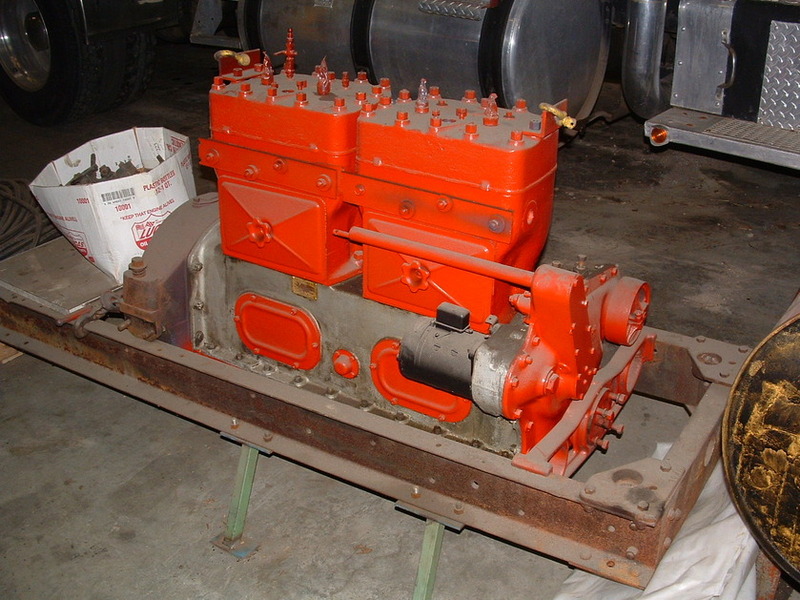 The Waukesha GU3E engine has no pistons, connecting rods, or gaskets and the hand start crank is welded to the frame, However the crankshaft had been polished at one time. The Clutch, and pressure plate are missing. The tracks and adjusters are completely worn out. The International power plant for the Gradall is stuck and needs a total rebuild. The Rockford over center clutch is missing and the shaft has been burned off with a torch. 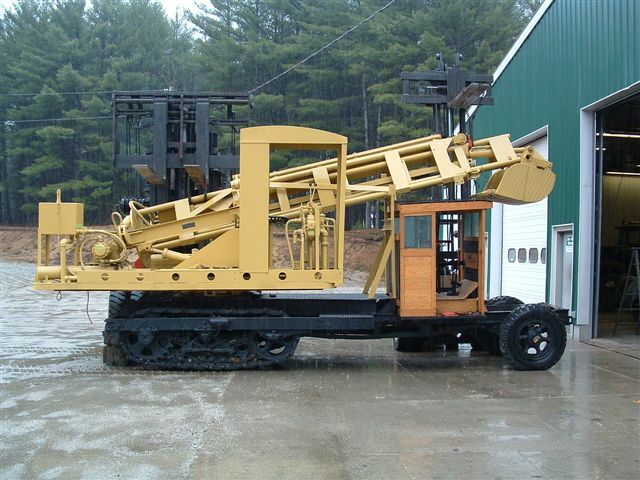 There are 11 hydraulic cylinders and a whole lot of steel hydraulic lines. All are full of water and rust. All of the rubber hose is dry rotted. The huge valve is almost a solid chunk of rust. Strange enough the 3 chain driven pumps look as though they were recently rebuilt and only need paint. All of the swing rollers are stuck and about half are missing. The pivot shaft shows signs of once having a large bearing but all that remains is twisted metal. The Linn frame is still in 3 pieces from it`s trip to the scrapyard. Held together with a few tack welds. The rebuilt cab is fairly correct except for the wood panels and color. Remove the tracks and driveline. This machine worked from 1928 to 1965 it`s not a wonder everything is worn out. Usually if you strip to the frame you can start to rebuild and reassemble. In this case Hours were spent straightening the frame and welding it all back together. This is all very heavy work and not a restoration for someone without the equipment to handle the project. The valve needs to be totally rebuilt. The pipes are in place but are either full of rust and water or are rusted through. 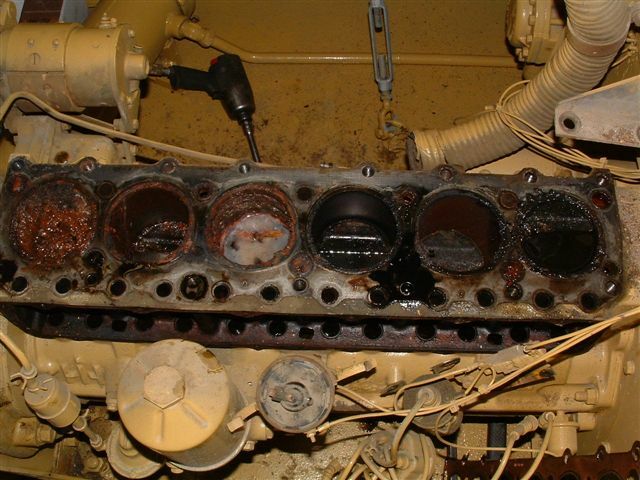 Here is a look inside the International Harvester power plant after sitting for over 40 years. 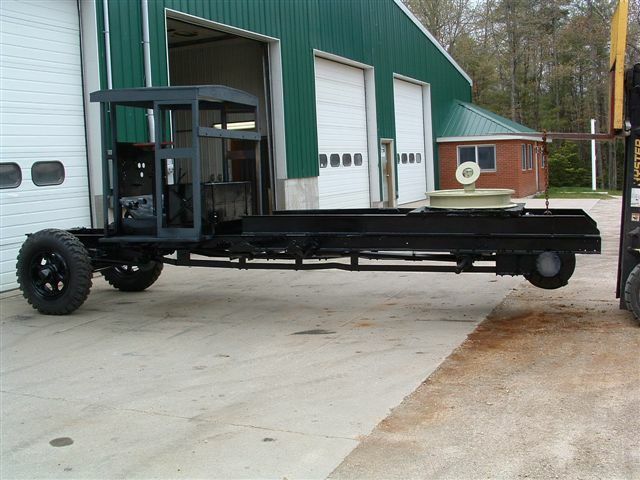 Shown here with the frame all straightened and welded together. The chassis has been sandblasted, primed and painted. The cab has been stripped and made more correct. Here the wood is in primer. Jack is Painting the wooden cab with the same color paint we discovered on Linn #2500. The transmission has been freed up and seems to function properly. The rear drive has new seals and seems to be in good working order. The color chosen for the Gradall portion is from an inside panel that looked to be original paint. I had it matched with a computer and tested it on several pieces before deciding it seems to be correct. 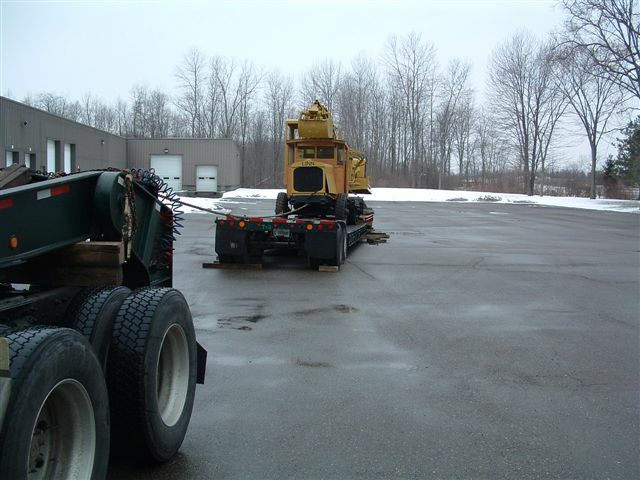 This was after returning from a very successful parts run to upstate N.Y. The Waukesha engine is compliments of Charlie Bilby. It is stuck but was easily freed up. It is the correct model and even the correct year. It is even sitting in a Linn frame. The tracks,idlers,and other drive parts are compliments of Ernest Portner. This will save many hours of repair work on the original parts. 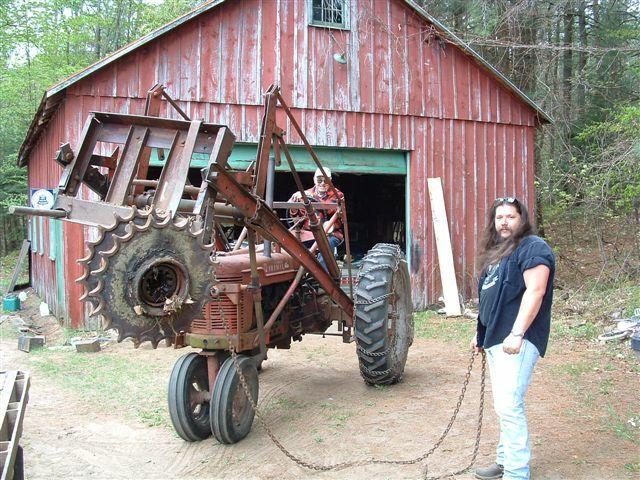 Ernest driving the Farmall while Erik guides the new used drive sprocket. 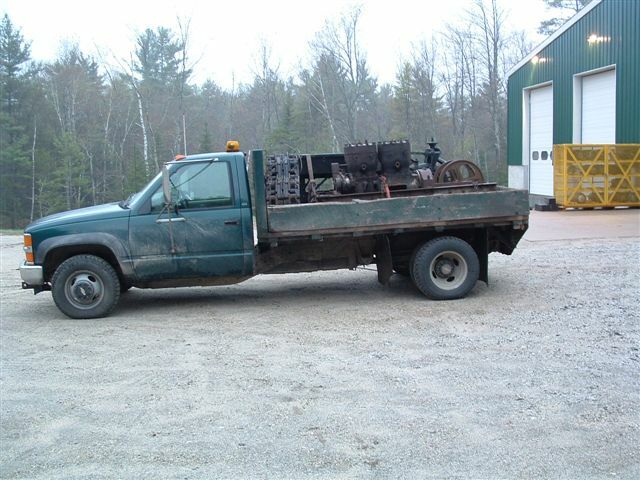 Charlie Bilby has the hoe in position for me to rig the big Waukesha GU 4 cylinder onto my truck. Shown here with the track adjusters rebuilt and the nice idlers and tracks from Ernest Portner. The whole chassis painted and assembled. The wooden part of the cab is done. The Gradall swing ring, bearing and rollers have been totally rebuilt. And the Gradall platform is installed facing the right way. Searching for and rebuilding parts can be very time consuming. Missing both clutches has been a big problem but the plan is coming together. 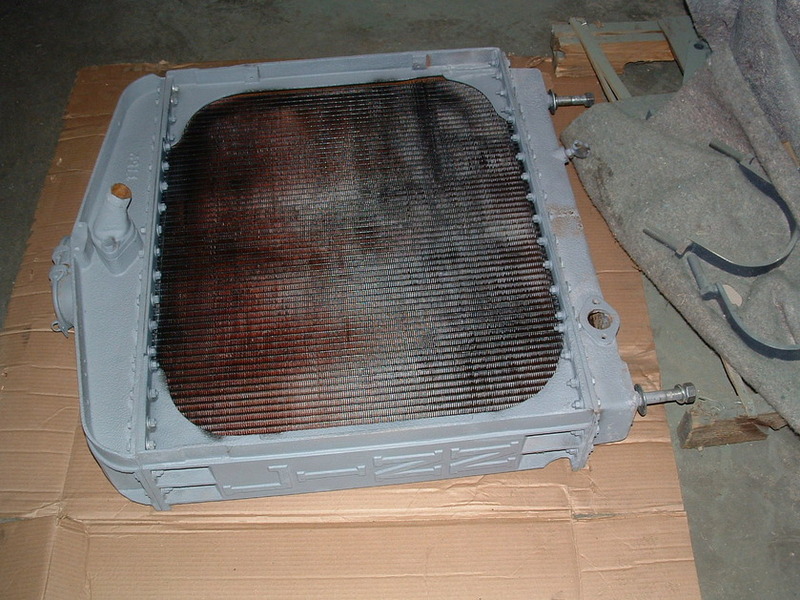 Here is the Linn radiator. Recored and primed. 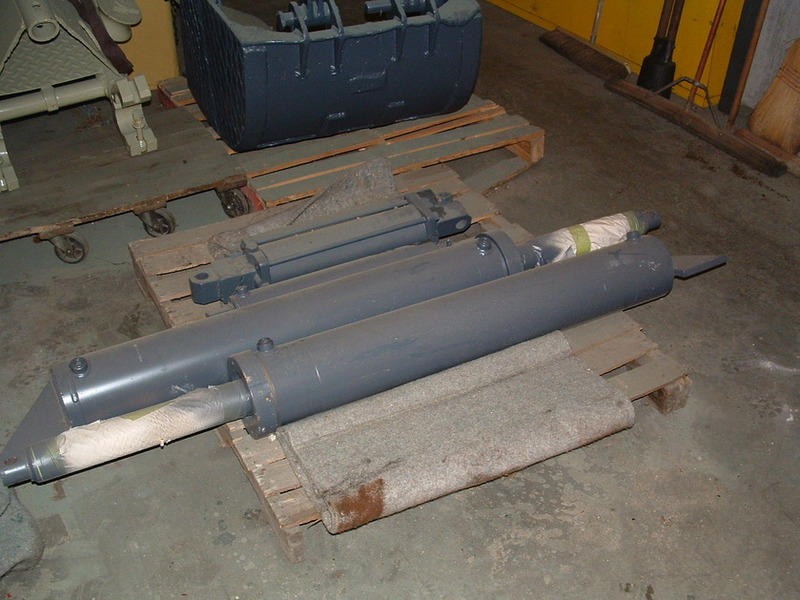 A few of the 11 hydraulic cylinders. All are rebuilt and primed. The Gradall bucket has been reworked with new pins, sandblasted and primed. 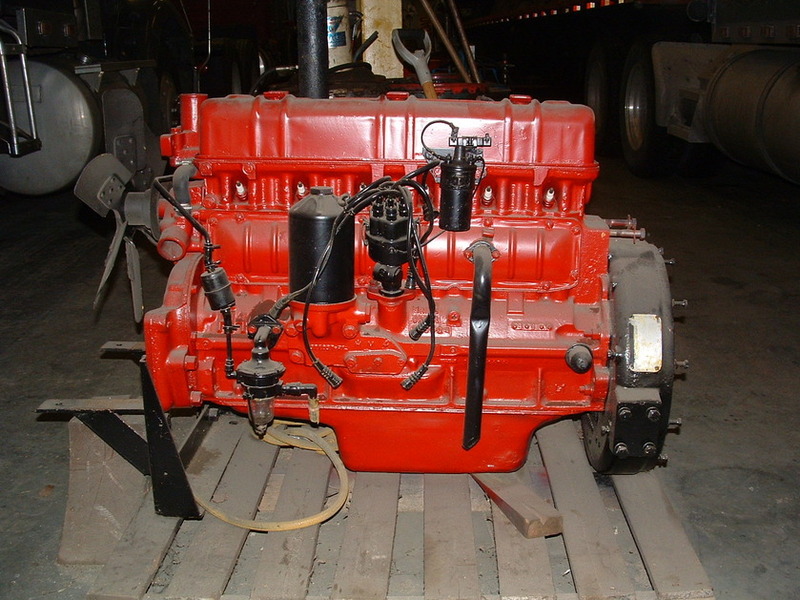 The 6 cylinder International Harvester power plant for the Gradall is totally rebuilt. 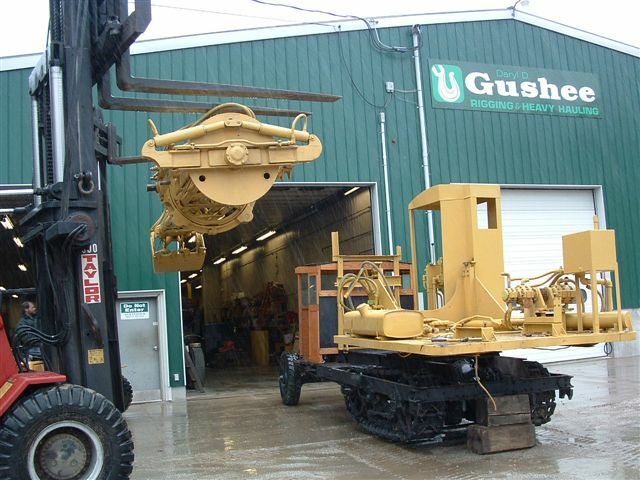 The big Waukesha GU3E 4 cylinder is free and painted. I did not tear it down due to a lack of gaskets. I have confidence in it. A big thank you to Charlie Bilby for this one. A view from the rear with the arm on the right way. 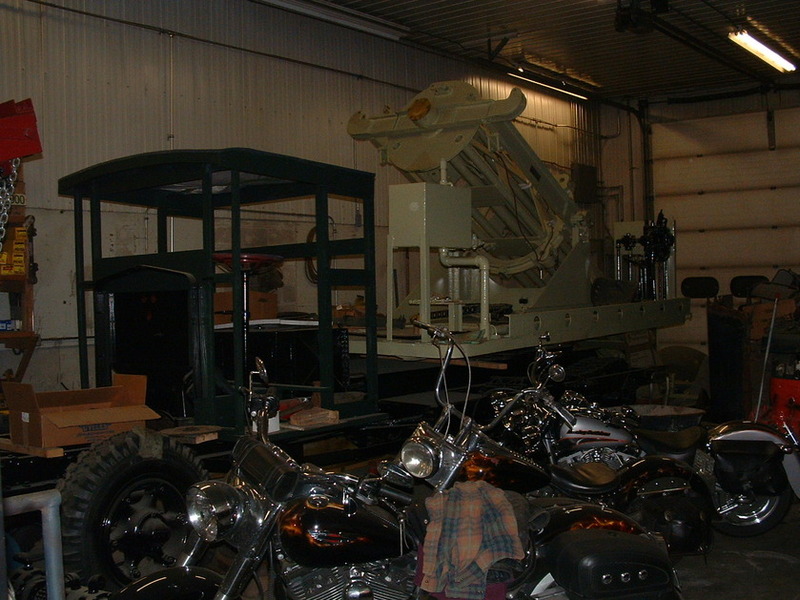 The arm has been rebuilt in every way including hydraulic cylinders, rollers, sandblast, prime and paint. 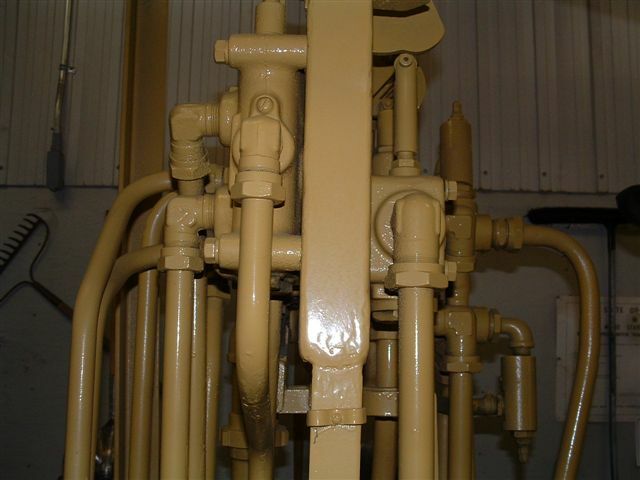 The steel hydraulic lines were cleaned inside and out. Any rusted through sections were cut out and replaced. They have been painted black and hooked up to the valves which were rebuilt utilizing spray weld and a lot of machine time. Original parts were reused in every case that was possible. Now you can see it coming together. I exhausted all avenues trying to find a good used over center clutch. Finally I purchased a new clutch for the Gradall. Charlie Bilby came through for me again with an old clutch, pressure plate, and flywheel for the Linn. Waiting for clutch rebuild then assembly can continue. 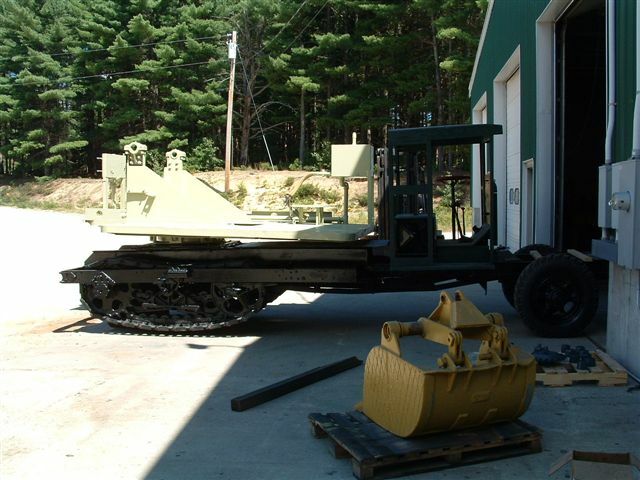 My first update since the old snowplow website went down. I have the engine and radiator in the Linn and most of it is hooked up. The I.H. power unit is Back on the Gradall. A nice round fuel tank that fits much better than the other tank is also installed. I also have the cab on the Gradall and am doing the finish work on that. I had it outside so I could put the power unit on so I took a few pictures. You can see the progress. 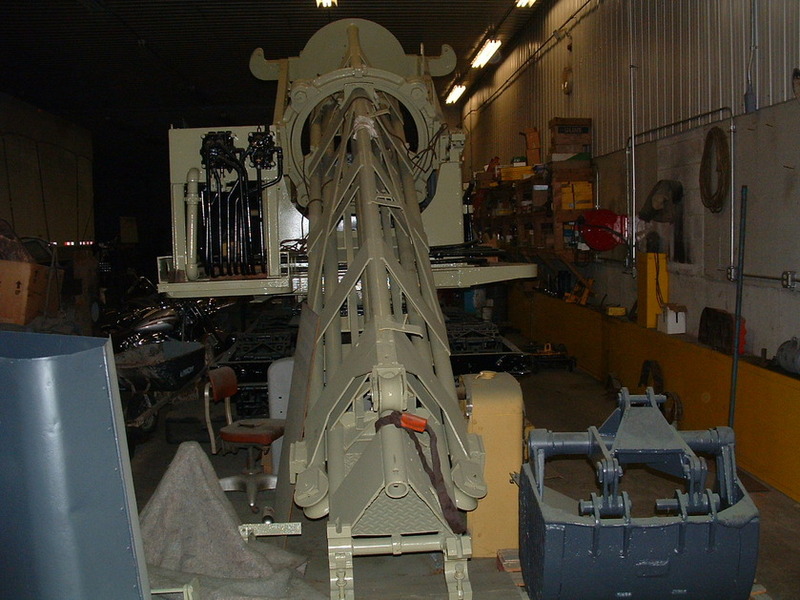 This view you can see the reel system for the hydraulic lines on the extendable boom and the pipe stands that were installed to hold the boom when not in use. There has been plenty of work done since these pictures were taken. I'll update again soon. There is some beautiful work there Daryl. What a great piece of history. That will really be something when you are done. I'm looking forward to the next update. All I can say is: WOW!!!! and WOW!! again.. That is one fantastic project..and great work. Thanks for the compliments. The pictures are small and hard to see on this website so I'm posting some close ups. I hope I'm doing the attachment right so you can click it and get it to come up big like Jeff does with the WAI. 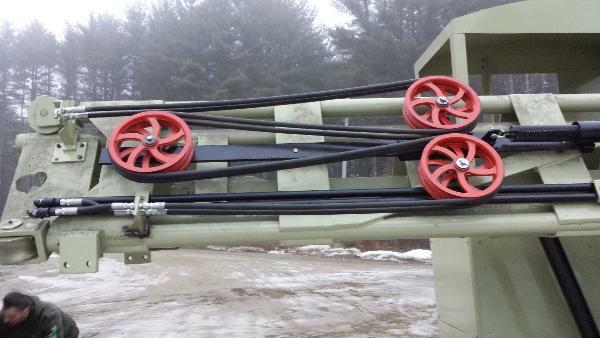 This is the reel system for the hydraulic lines. The big 4 cylinder Waukesha. It was missing the carburetor and I had this Stromberg M-3. Here is is before and after rebuilding. If you guys are interested I have lots more to show you. Daryl------You bum ! When you rescued the Gradall from the Crawford Museum Annex in Macedonia, you were about 3 miles away from our home . I recognized the building and knew about the Gradall as our NEO Chapter had a meeting there some years ago, plus we hosted a "White Bash" there about 7 years ago . 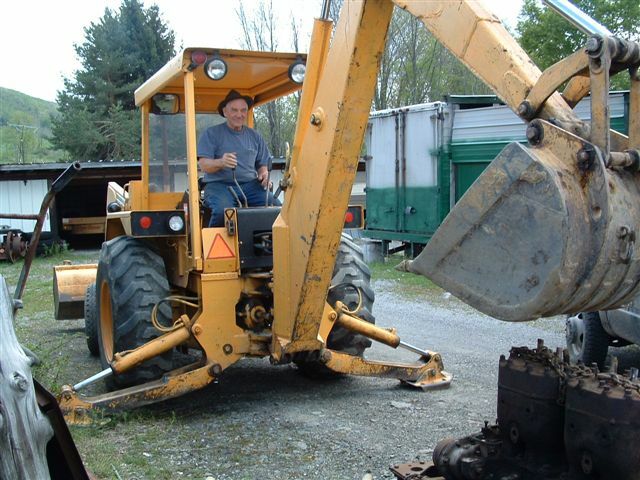 Rumors were stirred up again locally several years ago and I thought it went to Larry Kotkowski's Lakeside Sand and Gravel collection. I thought it was in his yard on the to-do waiting list, but he told me he didn't get it . Bilby and I raced on the local dirt tracks in 1953, he sent me a picture of our cars in action a few years ago . I mssed out on the rescue which could have been another tale to tell my grandkids . Thanks for the progress report . That was the wrong picture of the restored carburetor. Here is the one I wanted to post. Sure looks great! Lots of history for two companies in that machine.